A hastily packed few bags chucked in the boot of the car saw me leave London at 5pm on a Friday evening. I feared the worst – either a terrible journey or I’ve forgotten something crucial like my sleeping bag. Surprisingly the motorways were clear and I arrived at Dolgam campsite in Capel Curig at 9.15pm, just as it was getting dark and it had started to rain. I’d decided I wanted to get some height and the Snowdon Horsehoe seemed a good bet. I hadn’t been up Snowdon for a few years – the summer crowds put me off but I was tempted by Crib Goch. I was also interested in gauging my (poor) fitness levels, having been reading up on Alpine Courses and Mont Blanc. 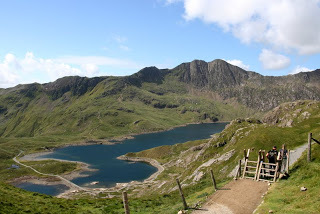 I awoke to a sunny, but rather blustery morning, which immediately gave me concern about my first traverse of Crib Goch, the guide-book words about avoiding when windy sitting in the back of my mind. Parking near the Pen-y-Gwyrd hotel I hot-footed up to the Pen-y-Pass hostel and immediately made for the Pyg Track which would give me the option of heading up the east face of Crib Goch, or continuing along the Pyg track. At Bwylch y Moch it was decision time but it was still rather blustery and I expected it would be worsen with altitude, as evidenced by the speed of the clouds whizzing overhead. Frustratingly I decided that today wouldn’t be the best time to test my nerves on the knife-edge, so I reluctantly continued up the Pyg Track. The route was full of the usual summer mix of families, large groups and fancy-dress parties. As I reached the zig-zags it started to rain a little and the temperature dropped, so I donned my new Rab Cirrus wind-shirt which seemed to shrug off the few spots of rain. Snowdon’s summit was as packed as ever so I elected to huddle behind a wall by the new visitors centre, sheltering from the wind to have lunch. 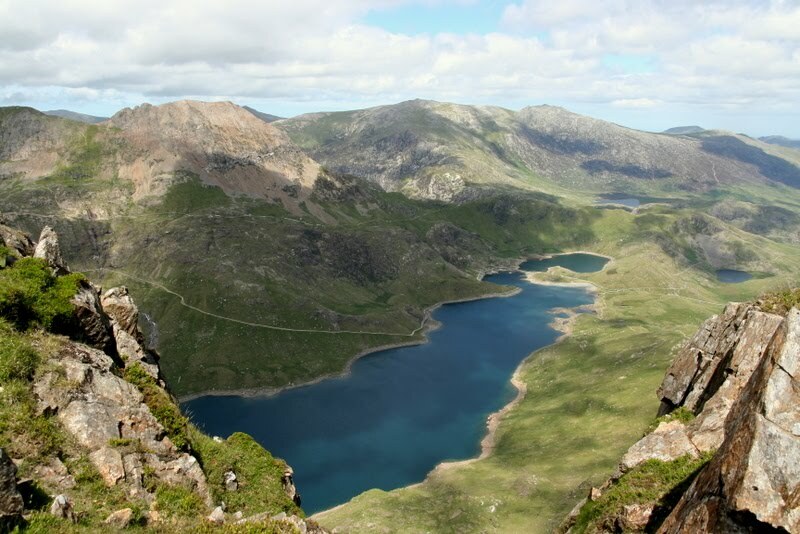 I had never traversed over Y Lliwedd and its imposing cliffs looked even more impressive viewed from Snowdons peak, though the view back along Crib Goch left me with some regret. 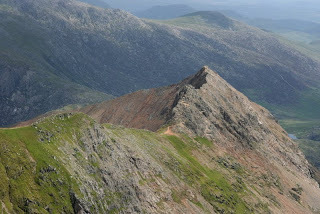 I left the summit by the south ridge for about 100m before dropping south-east where the Watkin Path route joins. Losing height height I kept near the cliff edge to make the most of the rock-hopping opportunities on offer before scrambling up to reach the West Peak of Y Lliwedd, quickly followed by the East Peak. From here it case a case of picking my way down towards Lliwedd Bach and following the feint path back down towards LLyn Lydaw. On the descent my ankle was pretty painful – I strained my ankle ligaments 4 weeks ago and the descent had eventually taken it’s toll. I’d been chatting to a couple of climbers who’d also come up from London the evening before and one of them kindly lent me his walking pole (thanks Hajaz) which eased the load as we descended to meet the Miners Track and trudged back to Pen y Pass. A cool beer back in Capel Curig also seemed to help ease the pain! So not quite the full Snowdon Horseshoe – similar in length but not profile and Crib Goch will have to wait for another day (soon). But as I’m trying to get hill-fit it was good to get in some miles and metres on a beautiful day. PS. It was the first outing for my Rab Cirrus windshirt – it’s laughably thin, windproof and shrugged off mild rain without problen. I kept it on whilst working hard up-hill and it seemed to breathe well. The only slight niggle was that the Pertex Quantam fabric is so thin that in high winds a slight excess of material on the arms would catch the wind and flap with a wild slapping noise…and one of the chaps I met asked if it was a base-jumpers top – he was expecting I was going to launch myself from the cliffs! Great photos and I know what you mean about the Rab Cirrus – my Lite Speed is ridiculously thin but seems utterly indomitable against even strong wind. 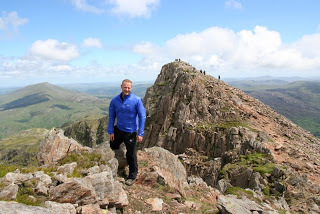 At the top of Scafell & Bowfell, it kept me warm atop only a short-sleeved base layer. It was wind-chill that caused the cold that day so a windshirt was always going to be effective. Nice photos and walk Nigel. Hope you heal well and get on the hills again soon.